A quiet space perfect for reflecting upon the spirit of hope, peace, and JOY of the Christmas season. 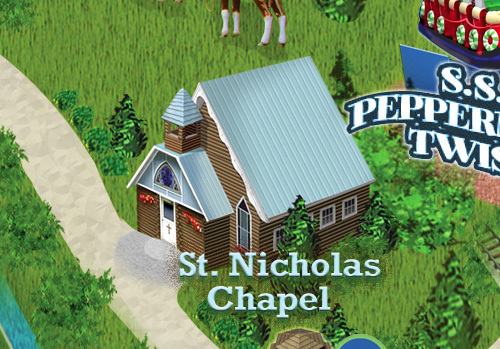 Saint Nick’s is one of the oldest buildings at Santa’s Village, originally built in 1954. The altar was created in the late 1800s for Saint Joseph’s Cathedral in Manchester, NH. Seven bishops were consecrated in front of this structure before it was moved to All Saints Church in Lancaster, NH. In 1968 the Church donated the carved altar, rails, statues, and pews to the park to preserve these historic pieces; Santa’s Village rebuilt its chapel at that time, and continues to share these impressive works to this day. Visitors from the Boston area may recognize their own church among the dioramas in the glass cases at the entrance of the chapel. These were once a part of a Jordan Marsh Department Store display in Boston.